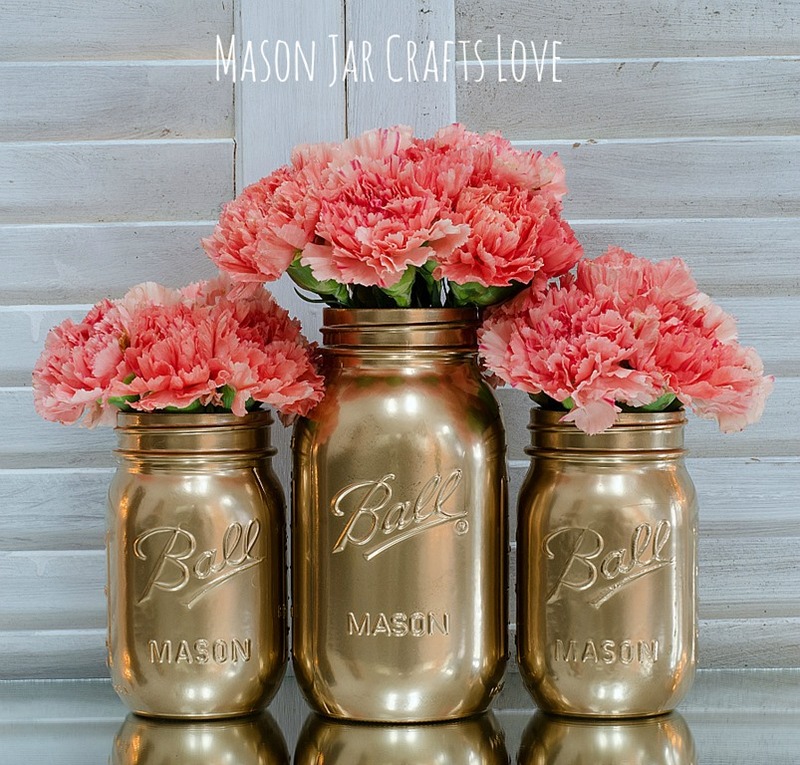 How to Spray Paint Jars – Gold Spray Painted Mason Jar Tutorial. … but, in my defense, I do have a few tips to share. 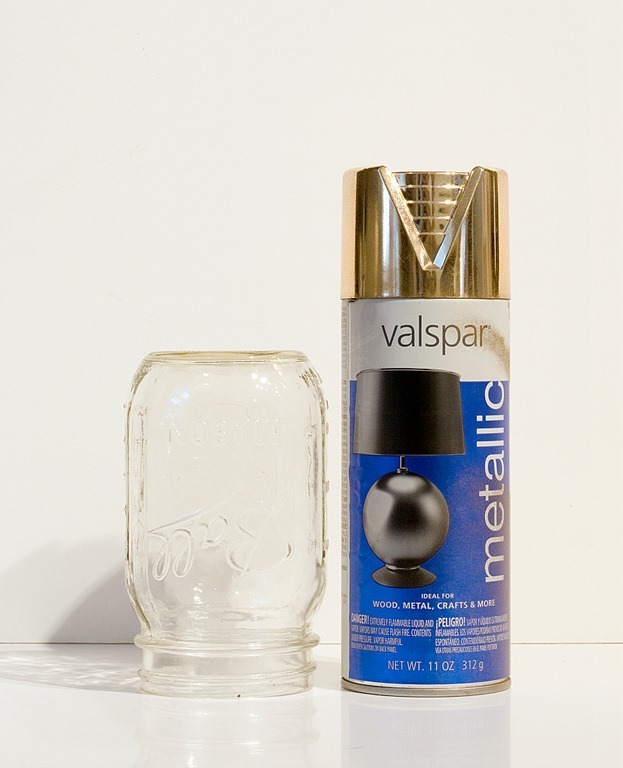 Valspar brand gold metallic spray paint. I buy mine at Lowes. 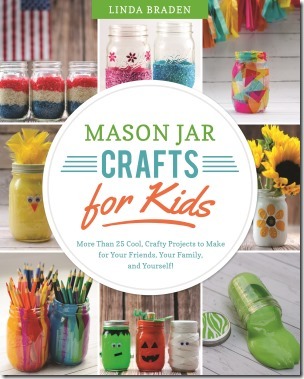 But here’s a link on Amazon (affiliate link). 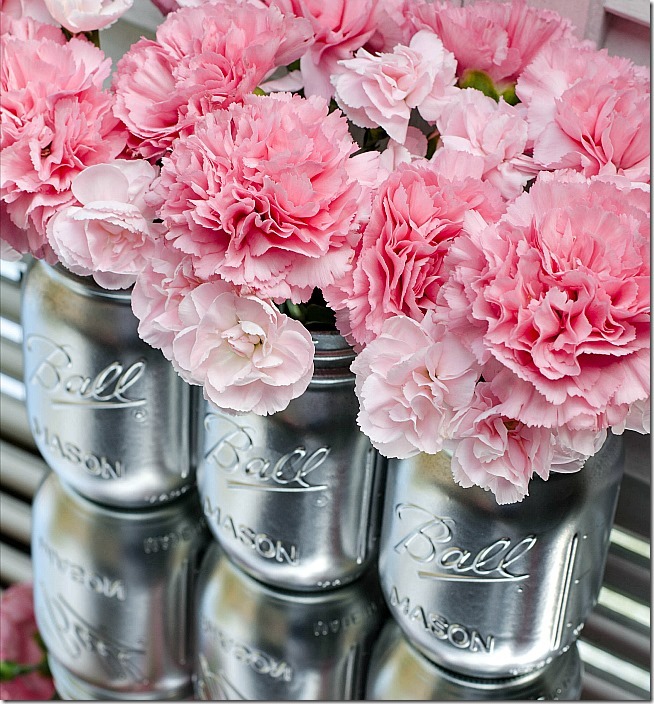 … and not just because I love the sound of those beads in the can rolling around. It really does serve a purpose to keep the paint mixed up. Then there’s (3). I spray side to side. Shake. Depress nozzle. Move from left to right. And back right to left. Four (4) is the most important one. Especially when using this particular brand of gold spray paint. I only use one coat. Okay, one thick coat. Most spray paint instructions tell you to use multiple thin coats. 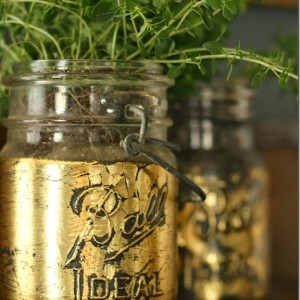 But with the Valspar Metallic gold spray paint, I found that multiple coats dulls the metallic finish. So I do that shake and depress the nozzle and move left to right. And back again right to left. And maybe a few more sweeps back and forth to make sure the coverage is complete. And that’s it. 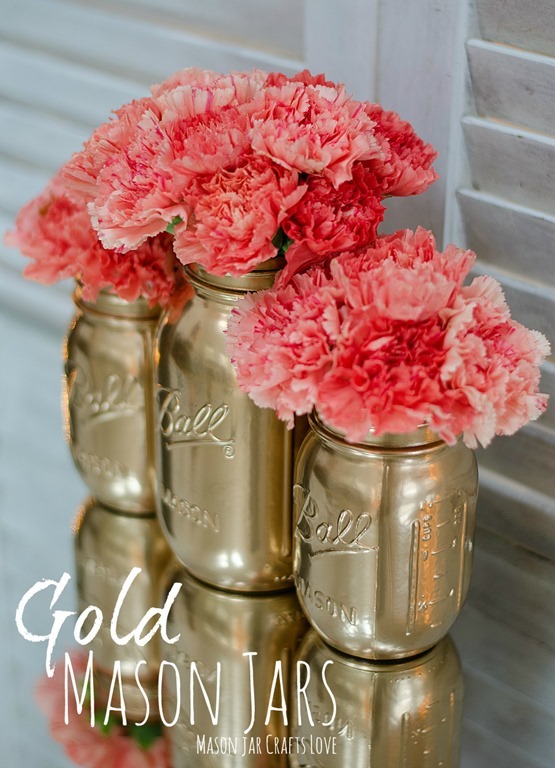 My 4 steps for success in spray painting mason jars gold using Valspar Metallic gold spray paint (affiliate link). Great painting tip. 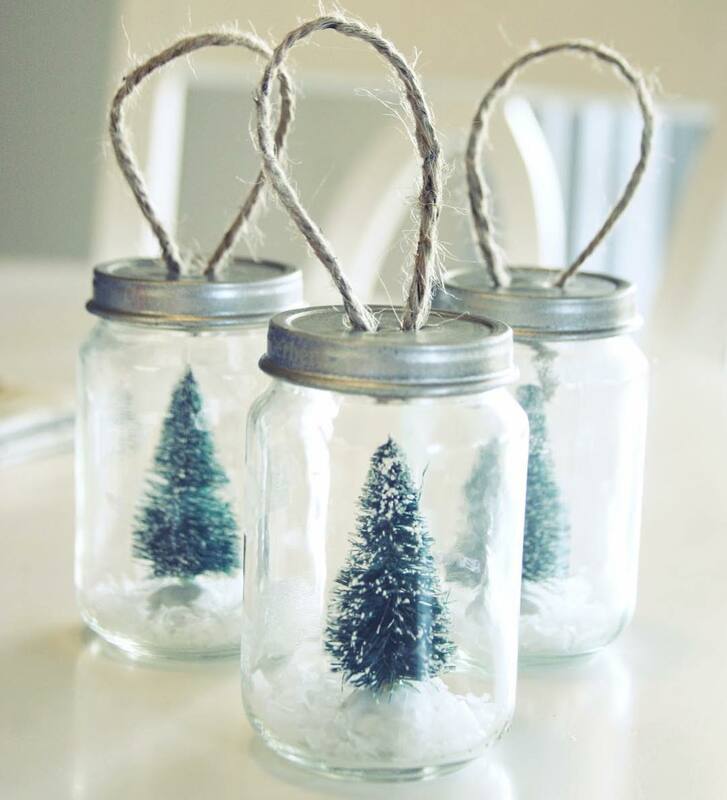 I would also love to know your tips for drying the jars. Do you just keep them upside down to spray and dry? If so, do you go back and spray the top rim after the bottom has dried? Thanks! Do you use a clear coat or anything ?? Or just the one coat of gold paint?? These are beautiful! I don’t use a clear coat with the gold spray paint. It discolors the paint. Linda these are beautiful. 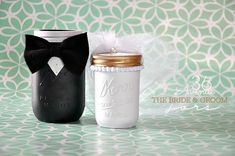 I am planning a bridal shower and I would like to paint the mason jars Navy Blue. Would I do the same thing for this? Any suggestions you might have? Thank you! Yes, spray paint will work! 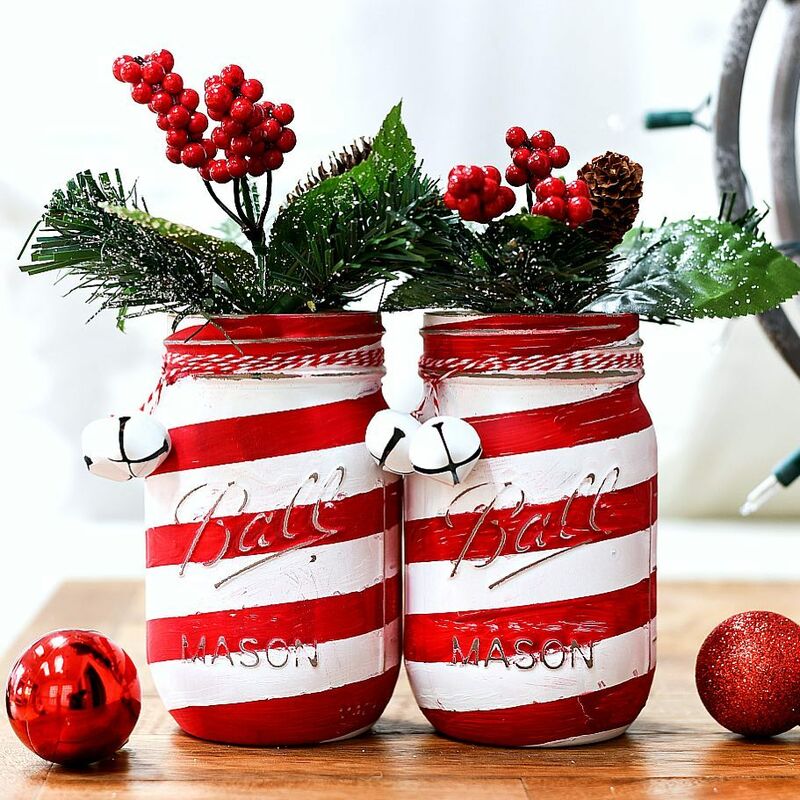 But if you don’t have a space to spray paint, you could also hand paint with a brush (not a foam one, a bristle one) using acrylic craft paint. You’ll need at least two coats. And make sure you don’t get the Enamel or Multi-Surface since those are more transparent. Then seal with a clear spray top coat – you can use a matte or gloss finish depending on your preference. 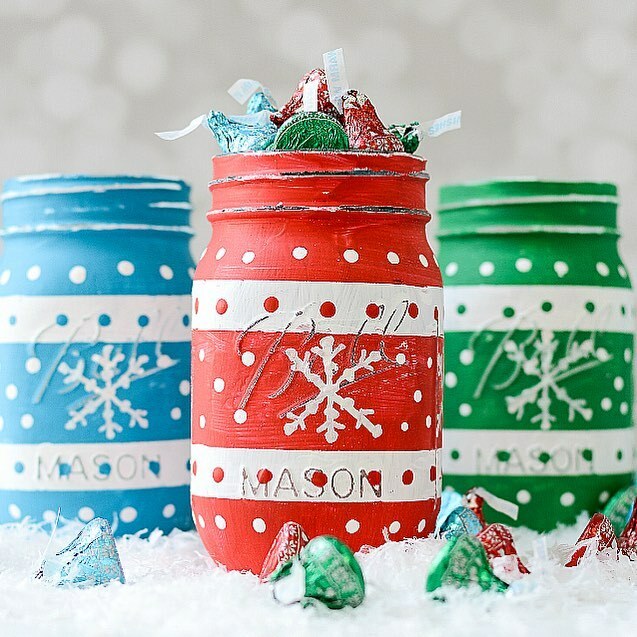 How many jars can you paint with one can of spray paint? 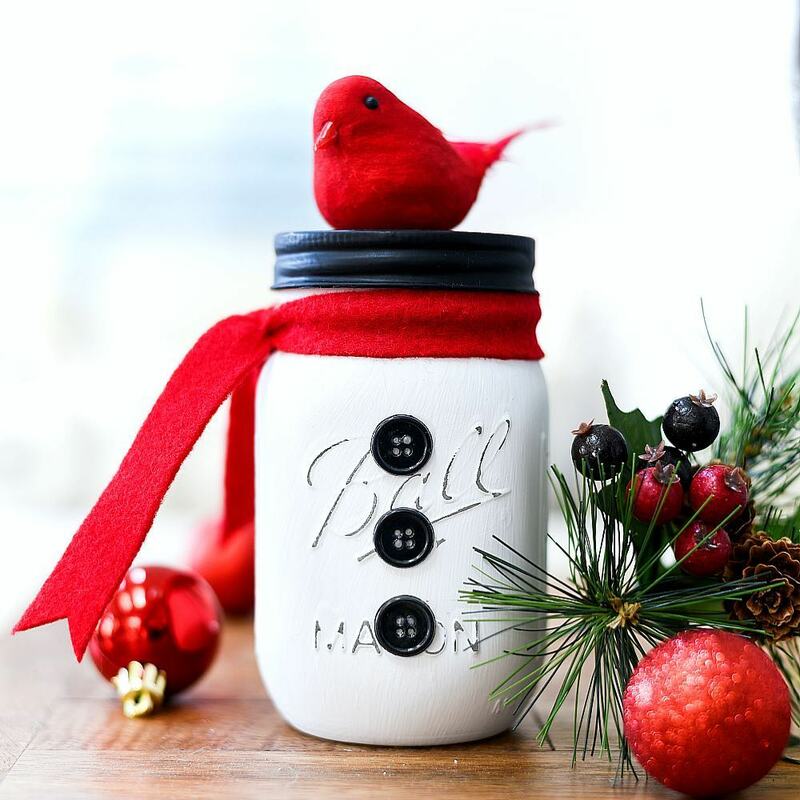 are you painting the outside or the inside of the mason jar. 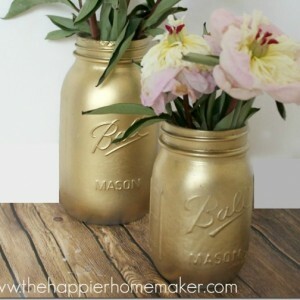 When I paint mine gold for Etsy, I paint 1 thick coat first, then a clear coat over that after it dries. Once clear coat has dried, I spray another coat of the gold ON TOP of the clear to get back that shiny finish. I have found that the metallic paints are very sensitive and chip at pretty much nothing. I wrapped one in bubble wrap for a customer and even the plastic was causing it damage. 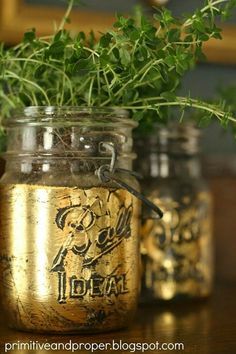 With that extra layer, if it chips, you’ll still see a dulled gold underneath and it give it a nice rustic look. I, too, use that spray paint. Valspar is the BEST! Thanks for the tip! I’ve had that same bubble wrap issue. Now my first layer is the smooth side against the jar. 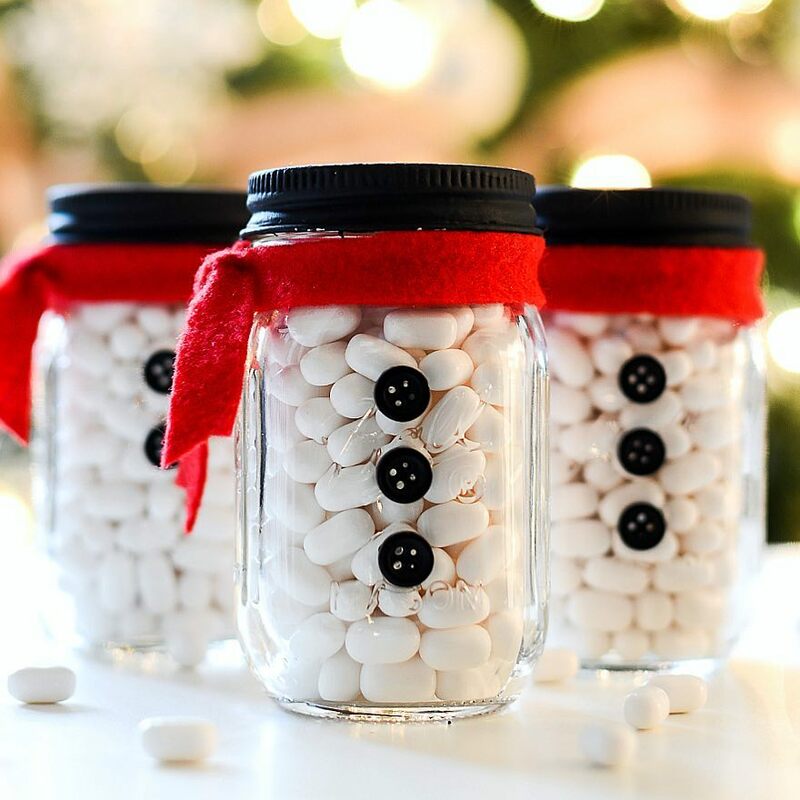 I also give them at least two days to dry before wrapping, and sometimes three if I can! never use plastic next to clear coat.. adherence is certain.. Thanks for the tip! I’m thinking you learned this the hard way … ? 😉 I’ll be sure to keep anything plastic far, far away! 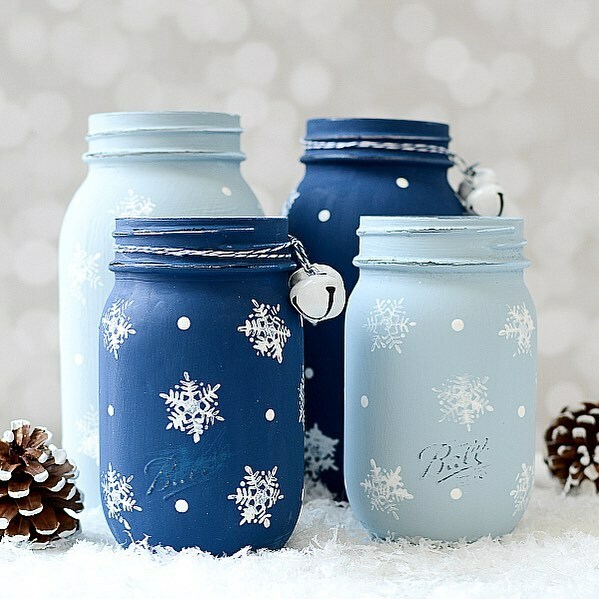 Do you do any kind of prep work to the jars before painting them? 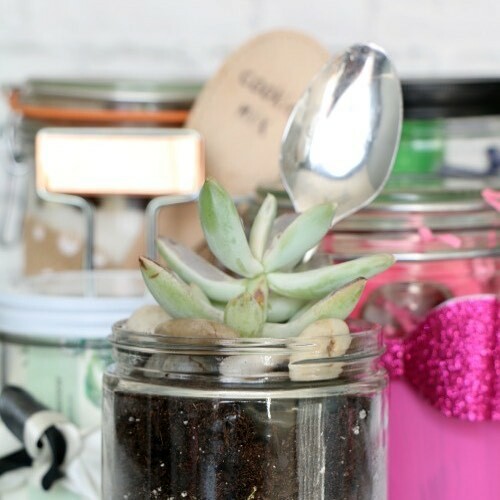 I just make sure they are clean – especially if I’m using jars that have been used. I wash them with hot soapy water and let dry completely. I’ve never tried that before but my first reaction was no. I’m mostly worried about the fumes in the house since the spray paint is so strong. 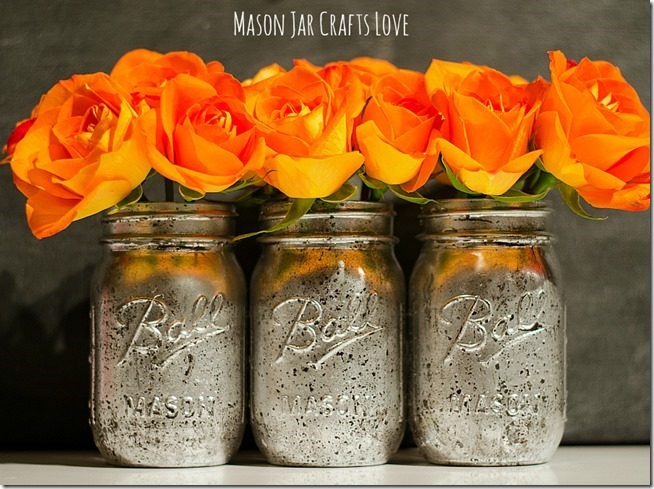 Is it safe to spray paint mason jars for candles? I would love to use my pastel spray colors for my homemade beeswax candles but will the paint still be a hazard once dry? I’m not sure but I don’t think flames and spray paint would be a good mix. Perhaps if you can make sure the flame doesn’t get near the paint. Hey , do you bake these Masson jars after painting ? may i use this for a digital collage? P.
I’m not clear on what a digital collage is? 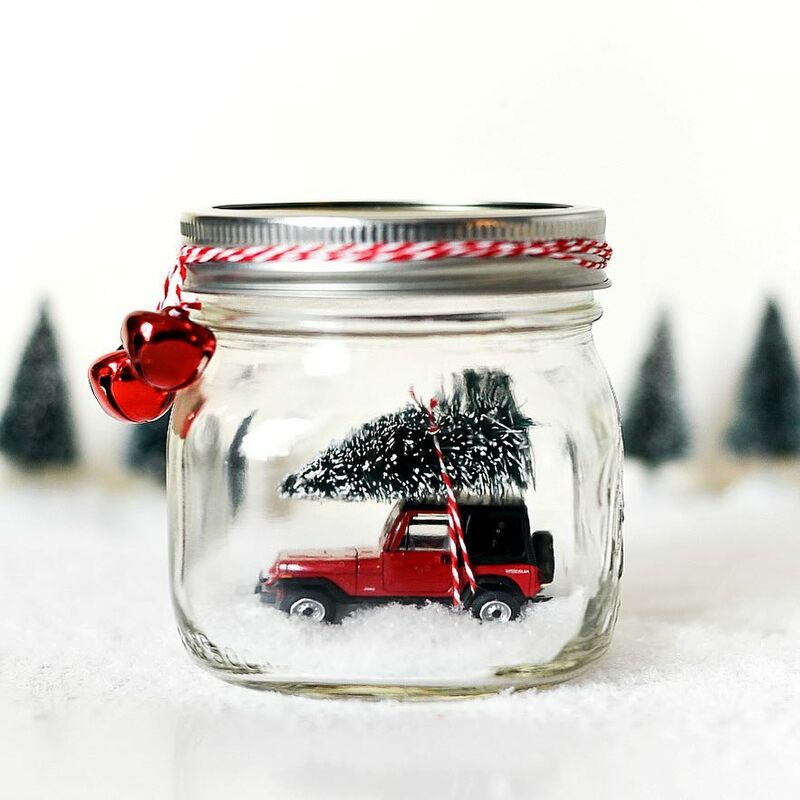 You can use an image with a clear link back to the post. 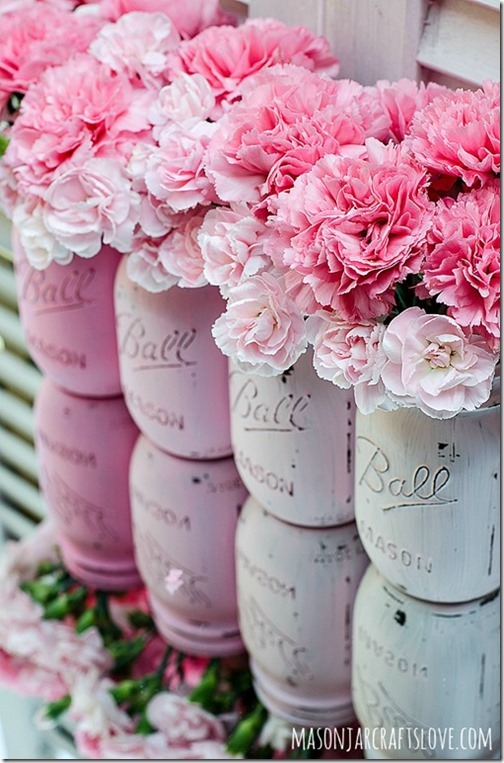 These are very pretty. Do you paint the bottom? Sounds silly but I have never done this before. Yes, I do paint the bottoms and then turn upside down (mouth side down) to dry. Does the Valspar brand paint chip? 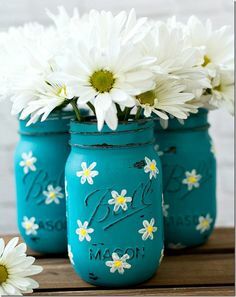 I’m having such a hard time with my painted jars, perhaps it’s the brand I’ve used? I’ve never had chipping issues. 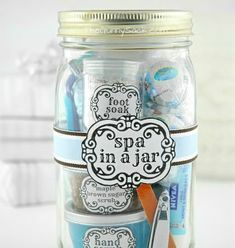 You do need to handle the jars carefully after sprayed, though, because they can scratch. But I use Valspar and have the best results with that brand. I’ve read where you can bake painted glasswear to give a more durable finish. 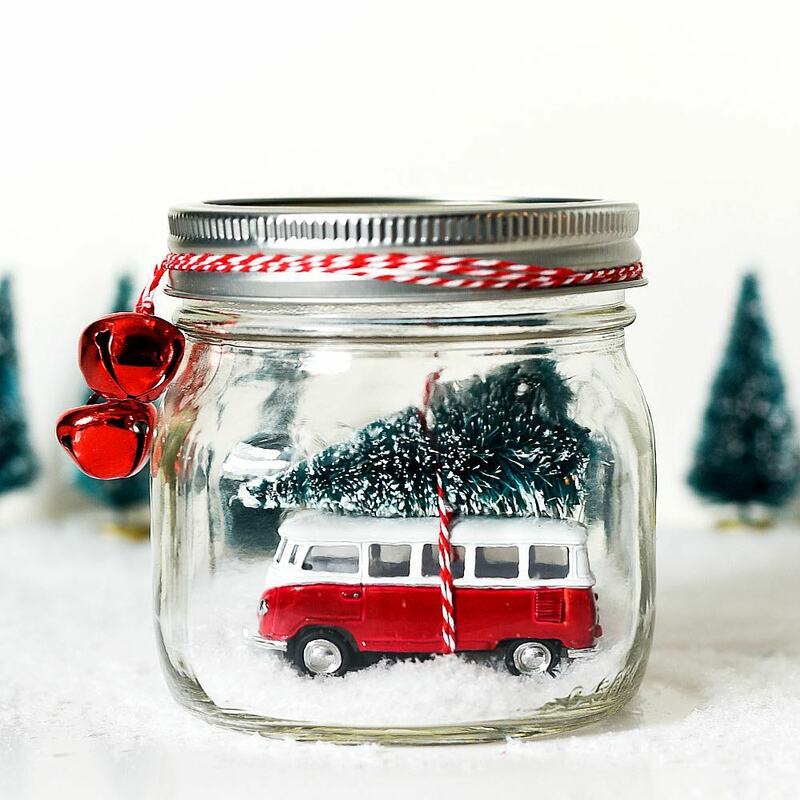 Place glasswear on an aluminum foil lined cookie sheet or something equivalent, place in cool oven and turn on to 350° (Do not put in preheated over or glass will break). Bake for 20 mins. Let them cool before taking them out. 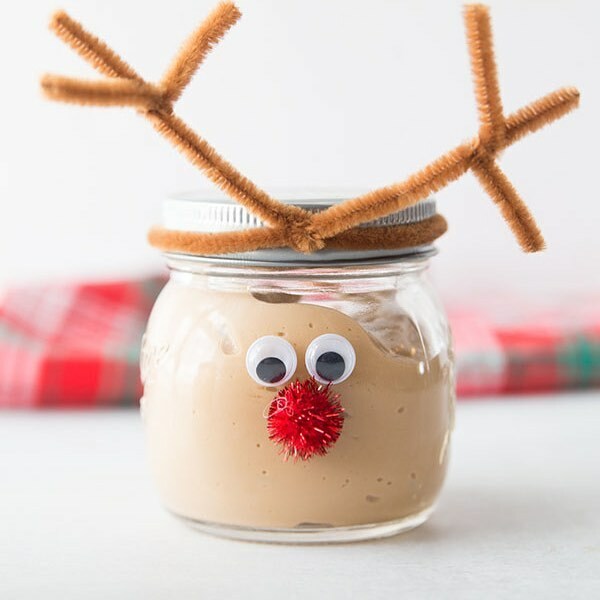 I haven’t done this yet but am excited to try!! Good luck and Happy crafting. 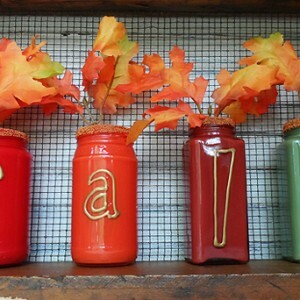 I’m not sure about doing this with a spray painted jar. It will certainly discolor the paint. 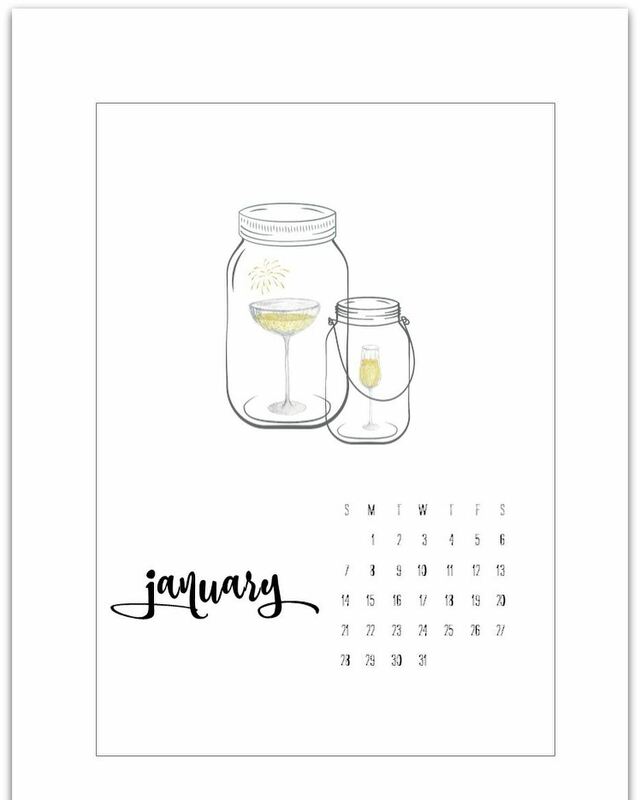 Have spray painted or used another type of paint for drinking mason jars and that could be washed? 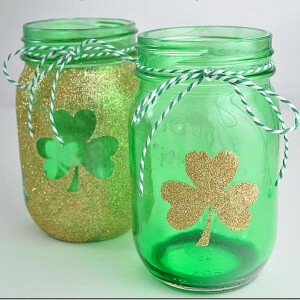 I haven’t come across any type of paint that could be used to make them safe for drinking or washing. Sorry. 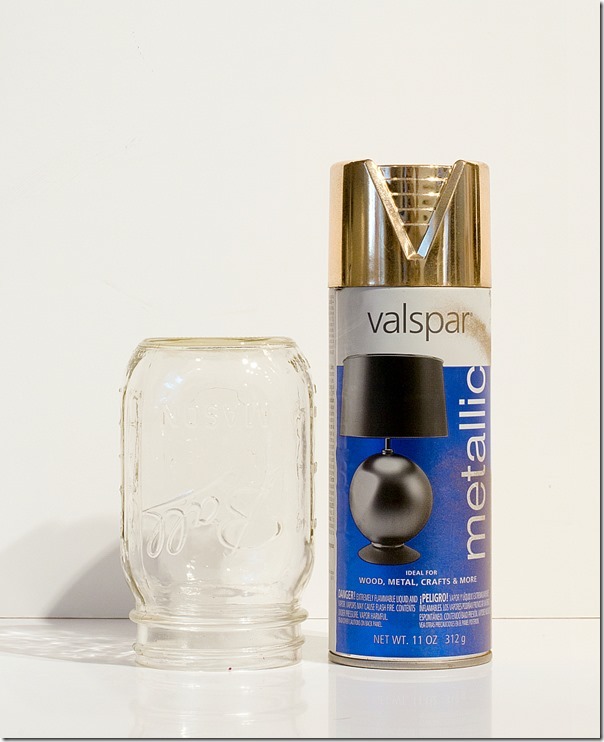 I picked some of the Valspar Silver today –thinking about using them for a mercury glass type jar for Christmas with battery operated tiny LED lights (another Dollar Tree lifesaver). Thanks for the info. 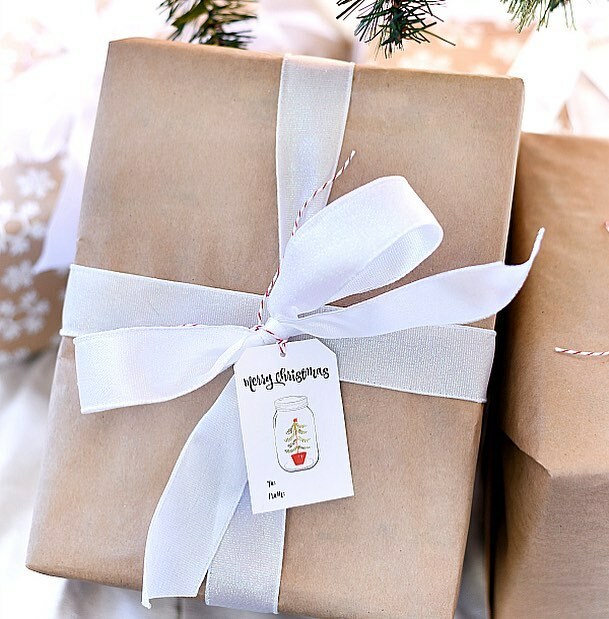 Happy Holidays to all. Your tips are so helpful! 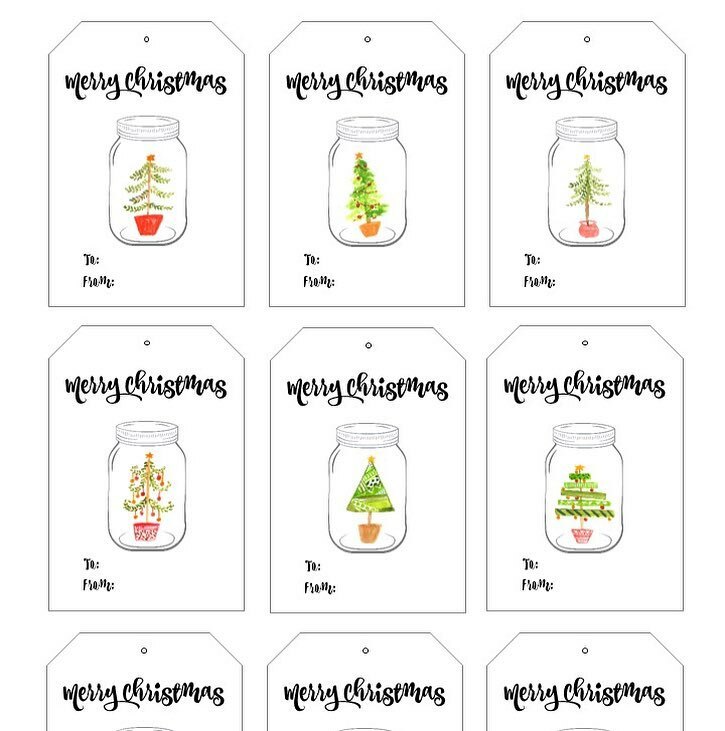 How many quart size jars do you think I can paint with the Valspar spray paint? Even a rough estimate would be helpful. We’re on a bit of a budget and the paint is expensive. Thank you! 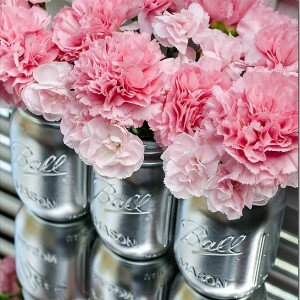 I have honestly not counted jars per can. I’m thinking perhaps a dozen or so? Honestly, I don’t feel comfortable giving a per can estimate because I fear I’ll be wildly off!